There’s a new M&S store that just opened up in my parents’ hometown of St Helens, and last weekend I was invited to pay a little visit and explore the great vegan options the store has to offer. 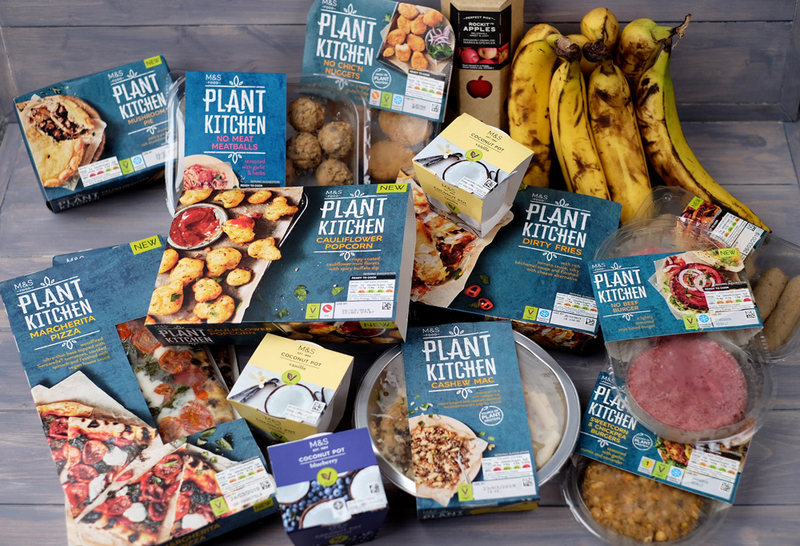 Naturally, it was a pretty exciting concept – M&S has recently released it’s Plant Kitchen range, making it one of my new favourite food places to shop. But not only that – I was excited to take a look at the new store, and see how it had changed from the famous high street store I remembered from my childhood. 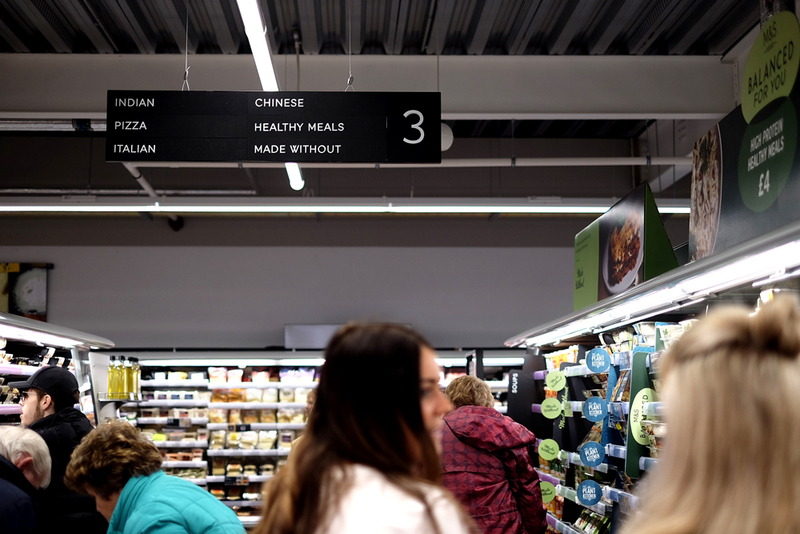 The new M&S store is located on Ravenhead Retail Park in St Helens – already a sign of how much larger it is than its old premises on the high street. Though some customers may be disappointed to learn of its new location, Ravenhead Retail Park really isn’t too far of a walk away, and it has several onsite bus stops to give more direct access to those using public transport. When you first step through the doors, the first thing you notice is how spacious, airy and bright the interior of the store is, and how well everything is laid out. Large leafy plants adorn the mannequin displays, giving off serious spring & summer vibes whilst also adding to the fresh look. 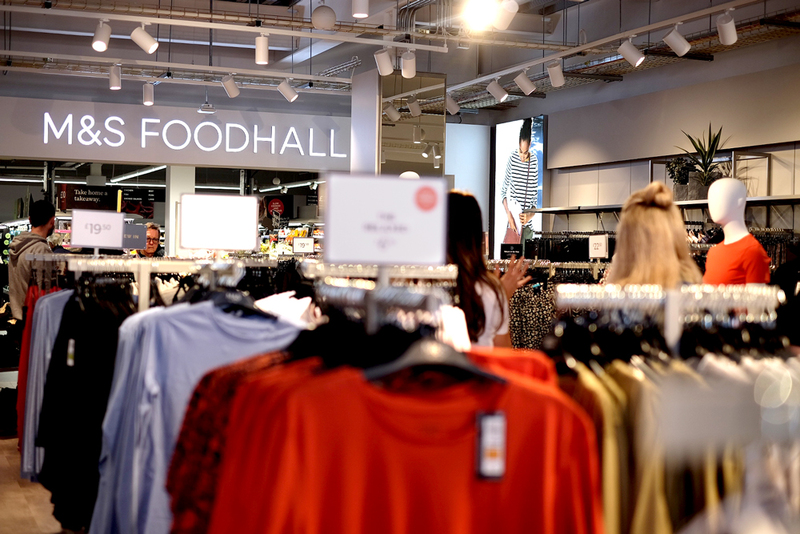 The Womenswear section, which occupies half of the ground floor, is incredibly organised and neat – no jumbled shelves or claustrophobic aisles to speak of, as is often the case in department stores. The clothes are organised clearly by purpose – formal wear, casual wear, holiday essentials, swimwear, shoes and bags – with certain pieces being displayed to match the mannequin displays, creating a lovely colour co-ordination that’s easy on the eye. At the back of the ground floor is the famous Food Hall, whilst upstairs, one can find the M&S Cafe, childrenswear and menswear. On arrival, we were met by the lovely store manager Lucy, who gave us a tour around the shop and showed us where everything can be found. Knowing that I was vegan (and that this is a huge theme and topic of this blog) she took me straight to the shoes and bag sections, where M&S have a great range of 100% vegan shoes and bags. When shopping as a vegan, you want to be sure that what you are buying is really what you think it is – often easier than it sounds in today’s non-vegan world! 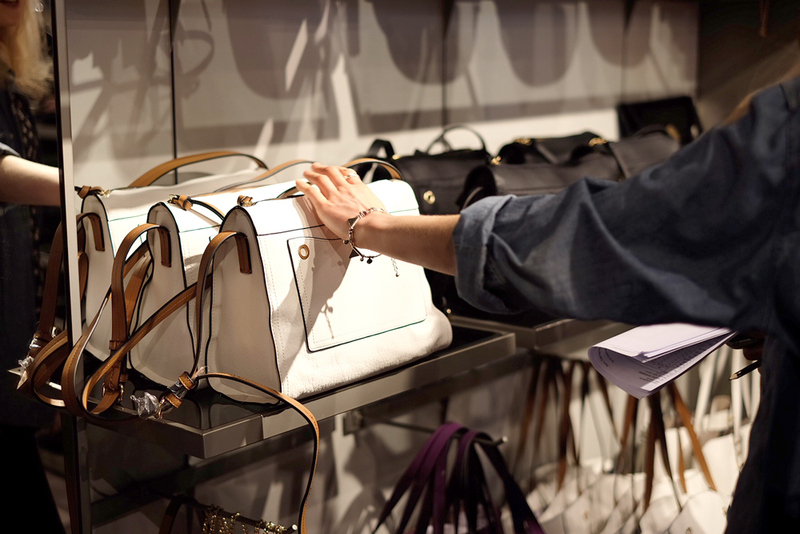 Though synthetic leather and other materials are easy enough to spot by checking the materials listed on the label, one thing that’s often not so clear is the dyes used in a particular product, or anything else that may have gone into it that isn’t mentioned. Luckily, M&S are overcoming this by placing certified ‘Vegan’ labels on absolutely everything. The label is a clear, green ‘V’ symbol with the word ‘Vegan’ on it, and states specifically that the product has been produced using “non-leather materials and adhesives free from animal derivatives”. This, I think, is really quite something – it is not like your typical high street or department store to mark their clothing products suitable for vegans; much less have a full understanding of what the lifestyle means. 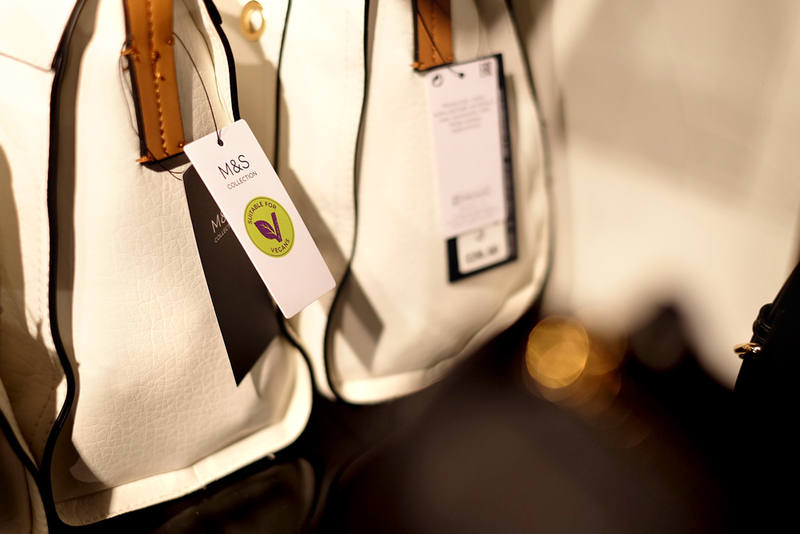 My faith in M&S is reinforced by the fact that the label is not always applied to certain bags of the same style that are in a different colour, meaning there are differences across specific products regarding their vegan-friendliness. This I find to be really reassuring, as its means vegans can shop at M&S knowing that every individual product has been valued for its vegan suitability, and that the label hasn’t just been applied to full lines. After that, Lucy took us on a tour of the new Food Hall, and showed us where we could find various vegan-friendly products. Of course, there’s the M&S Plant Kitchen range (if you haven’t already, check out my recent review here). Lucy actually told us that there are a few vegan desserts being added to the range soon, as well as a number of festive dishes in time for Christmas. Both of which, I cannot wait for! 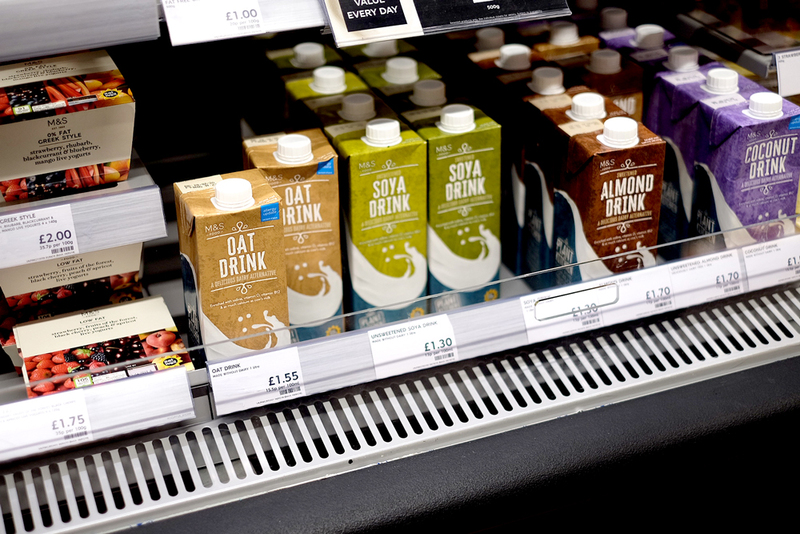 M&S also stock a number of clearly labelled vegan-friendly wines in their St Helens store. Though I am not that much of a wine person, I do love that merchants are starting to take note that wine-lovers might be animal-lovers too. Though there are already vegan-friendly wines on the market, it can be difficult to find ones clearly labelled as such, with most failing to list their ingredients (which might include egg whites), and much less the animal parts that were used to filtrate them, like fish bladders. 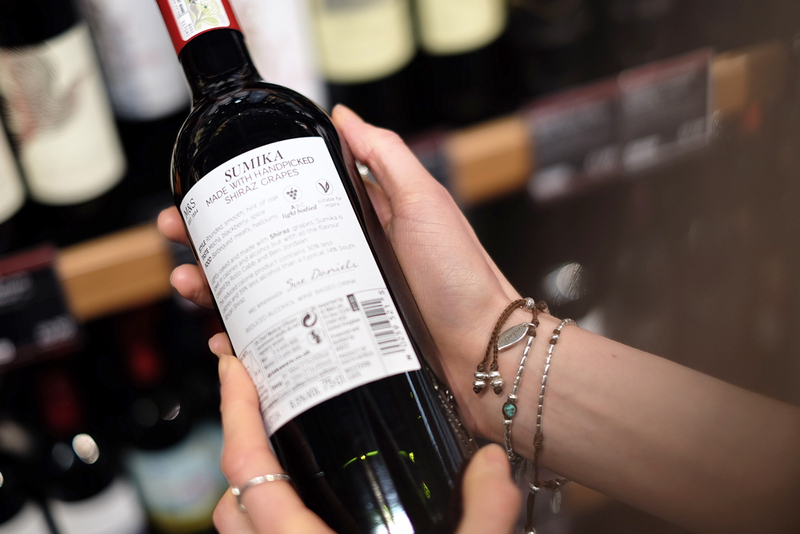 M&S are now labelling all of their vegan-friendly wines with the same ‘V’ symbol, making it easy for both staff and customers to find what they’re looking for. This means that choosing wine for yourself or your vegan friends no longer need be a hassle. 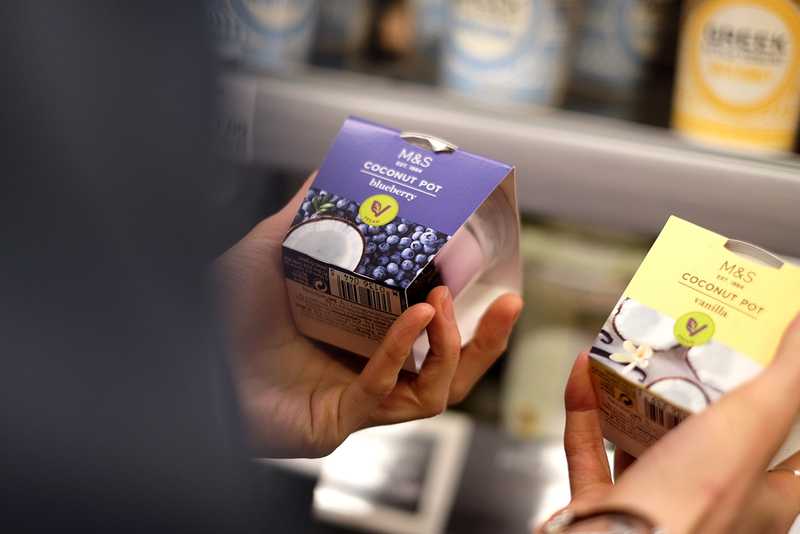 Browsing the fridge section, we saw that M&S naturally have a great selection of non-dairy milks (having done so for a while), as well as these cute little coconut yoghurt pots which are completely vegan and sugar-free! We couldn’t help but pick some up along the way. As part of my store visit to M&S Ravenhead Retail Park, I was invited to choose my own M&S Picks. 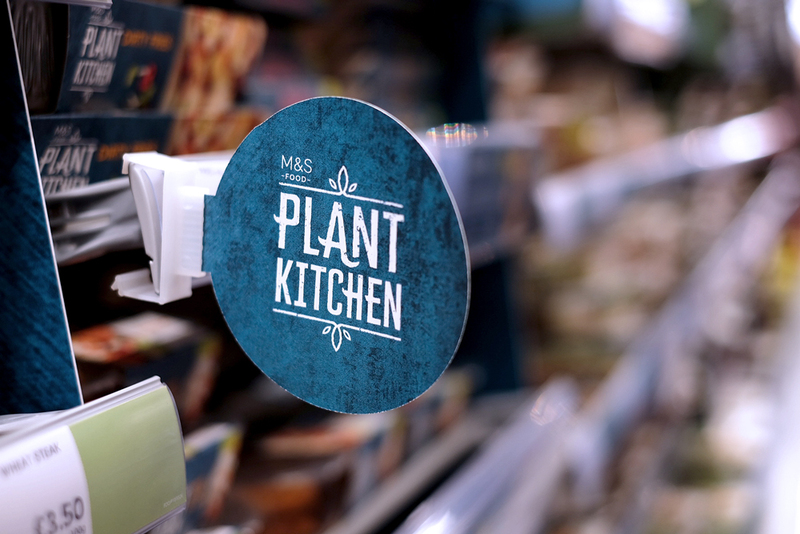 As a vegan this was really exciting, and a great chance to share some of the awesome food choices available at M&S St Helens. As well as the Plant Kitchen range, I also feel that M&S has always sold particularly great fruit, with quality and choice always being excellent. In my current bid to avoid plastic, however, I went for some Rockitt apples (in cardboard packaging) and some lovely ripe fair trade bananas. This gorgeous white and brown 100& vegan leather shoulder bag from the Womenswear range (pictured). Have you guys visited the new St Helens M&S store yet? 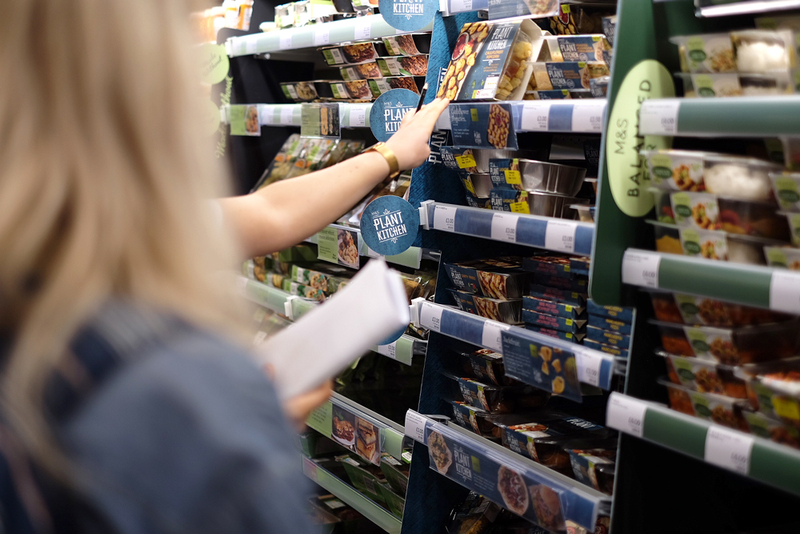 Or have you tried any of M&S vegan items? What did you think? Let me know in the comment section below! All of those items are bomb! Definitely some of the best in the range. I was blown away by the Cashew Mac & Cheese and the rainbow wrap is lovely. Even my parents love the coleslaw & potato salad and they’re not vegan!